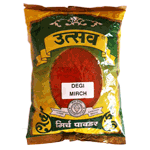 Degi Mirch is a spice and refers to dried fruits of chili peppers. It can also be grounded to fine powder. It comes in crimson red colour. The stronger the color, the stronger the flavor. As the ground chili pepper ages, it loses the color and the flavor. The flavour can range from mild to spicy hot. Product of India.